Here's an old Hollywood photo gallery about the life and career of Grace Kelly. This article is part of The Third Wonderful Grace Kelly Blogathon hosted by The Wonderful World of Cinema. 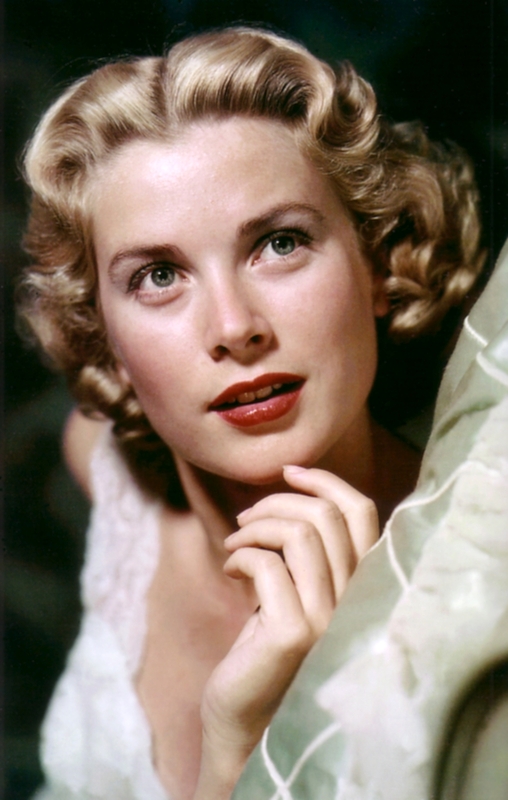 During her eventful lifetime, Grace Kelly was one of the most photographed people in the world. 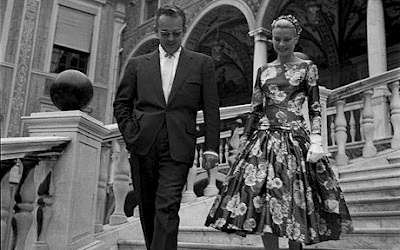 Her beauty, style, and acting talent made her one of the top old Hollywood stars of the 1950s, and her 1956 marriage to Prince Rainier of Monaco was an international media sensation. After her marriage, she devoted her time to serving the people of Monaco and raising a family. Tragically, Kelly passed away at age 52 from injuries she received in car crash. Today, I'm celebrating what would have been Grace's 88th birthday with a photo gallery of her life and career. Grace Patricia Kelly was born Nov. 12, 1929, in Philadelphia to a prominent Irish-Catholic family. This photo was taken while Kelly was attending the Ravenhill Academy. Kelly got her first taste of acting at the school where she played the lead role in the play Don't Feed the Animals (Photo source: The Independent). Kelly decided to study acting after graduating high school. She attended the American Academy of Dramatic Arts in New York City, which led to some stage roles; however, Kelly was most successful on TV where she earned a steady stream of guest parts. 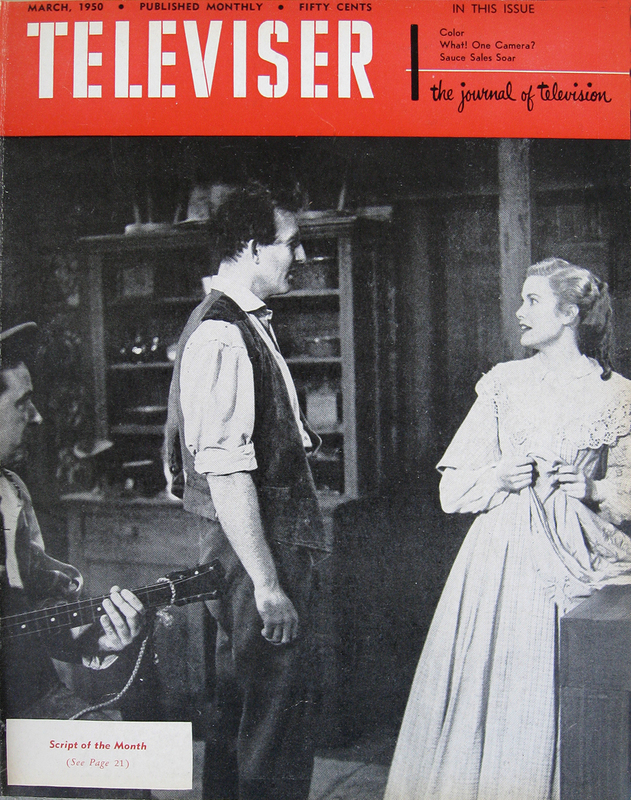 The magazine above shows Kelly in a 1950 production of Ann Rutledge for The Philco-Goodyear Television Playhouse (Photo source: Life as a Human). A small part in the film noir Fourteen Hours (1951) didn't lead to any Hollywood offers, but her TV work was noticed by producer Stanley Kramer who cast her in the pivotal role of Amy Fowler Kane (photo above) in the Western High Noon (1952). (Photo source: Pinterest). The massive success of High Noon earned Kelly a seven-year contract with MGM. Her first film for the studio was the action-adventure film Mogambo (1953). 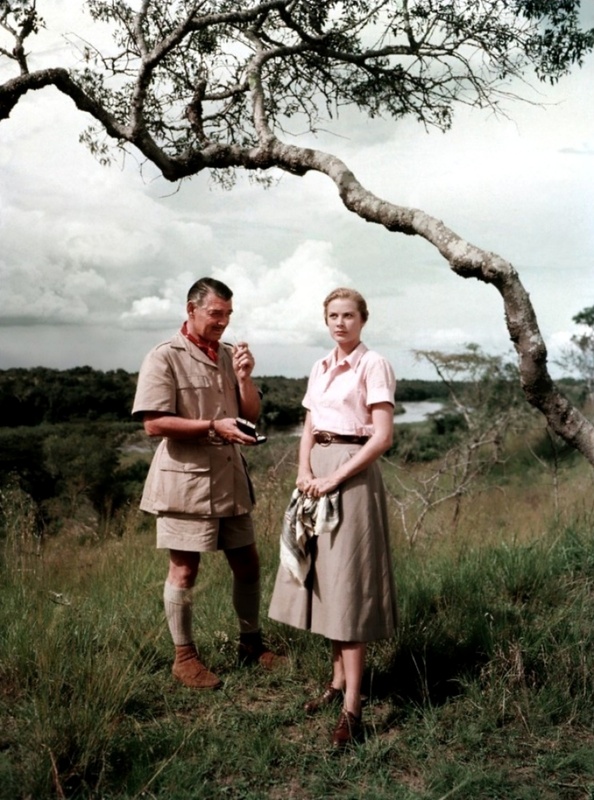 The photo above shows her on location in Kenya with costar Clark Gable. 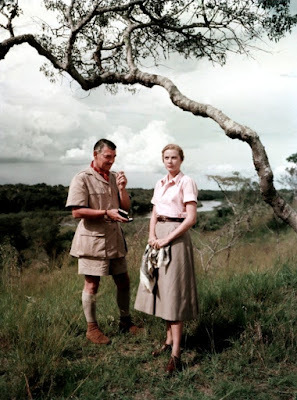 Kelly told gossip columnist Hedda Hopper that part of the reason she agreed to make Mogambo was for an all-expenses-paid trip to Africa. "If Mogambo had been made in Arizona, I wouldn't have done it," she said. (Photo source: doctormacro.com). 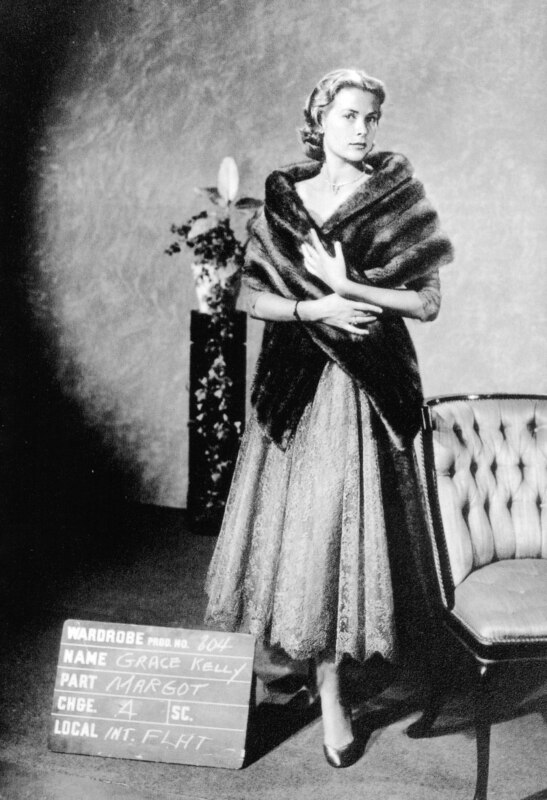 1954 was a breakthrough year for Kelly starting with Dial M for Murder, her first collaboration with director Alfred Hitchcock. The photo above is a wardrobe test for the film. (Photo source: The Hitchcock Zone). Kelly also took on a challenging part in the drama The Country Girl (1954). Kelly played against type as the frumpy wife of an alcoholic actor (Bing Crosby), and she won a surprise Academy Award for her searing performance (you can read my review here). 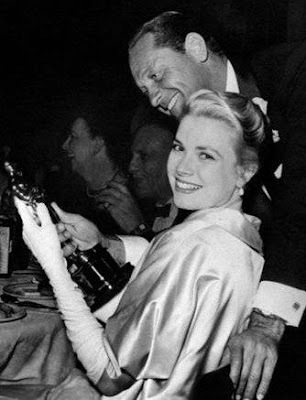 Here's an exuberant Kelly on Oscar night being congratulated by costar William Holden. Kelly's second Hitchcock film was Rear Window (1954). 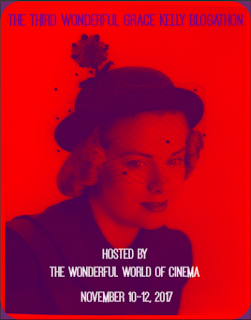 Her glamorous and witty performance as the fiancee of photographer Jeff Jefferies (James Stewart) firmly established Kelly as one of the top box-office draws of the early 1950s. Kelly also struck up a lifelong friendship with Stewart and his wife, Gloria. Here's Jimmy and Grace biking around Paramount Pictures back lot during a break in the filming. 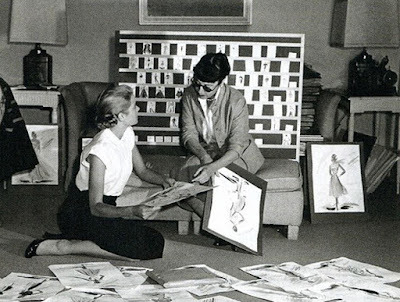 Legendary designer Edith Head worked with Kelly on four films: Rear Window, The Bridges at Toko-Ri (1954), The Country Girl, and To Catch a Thief (1955). Here they are looking over Head's costume sketches for To Catch a Thief (Photo source: Phyllis Loves Classic Movies). 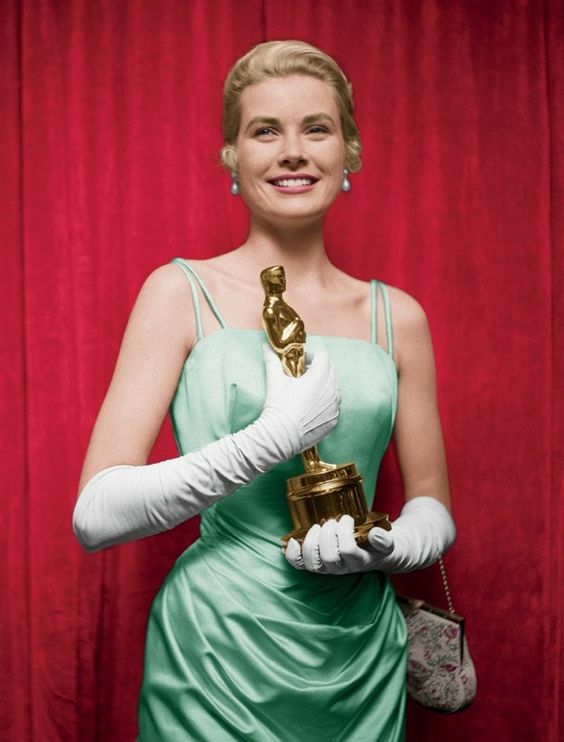 Head designed the champagne silk gown Kelly wore at the 1955 Oscars. The fabric, which was specially woven in Paris, cost $4,000. Kelly wrapped up a whirlwind 1954 by flying to the French Riviera to appear in her third and final Hitchcock film, To Catch a Thief. Here she is sharing a laugh with costar Cary Grant and Hitchcock (seated on stool). Grant later named Kelly as his favorite leading lady. "She had serenity," he said. Kelly returned to the South of France in April 1955 for the Cannes Film Festival. While there, she visited the tiny principality of Monaco where she met its ruler, the dashing Prince Rainier. Kelly and Rainier soon began a secret correspondence (Photo source: The Royal Post). 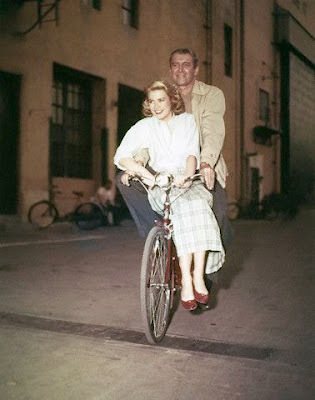 Ironically, Kelly and Rainier's romance blossomed while she was filming The Swan (1956), which is the story of a princess in search of a suitable husband. 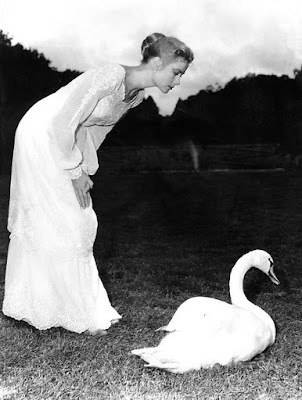 Here's Kelly contemplating a real-life swan on the grounds of the Biltmore Estate in Asheville, N.C. The movie was filmed on location at the lavish mansion once owned by the Vanderbilt family (Photo source: Pinterest). 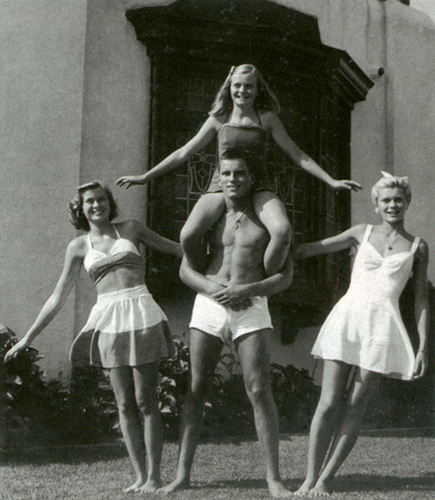 Kelly accepted Rainier's marriage proposal during the 1955 Christmas season. 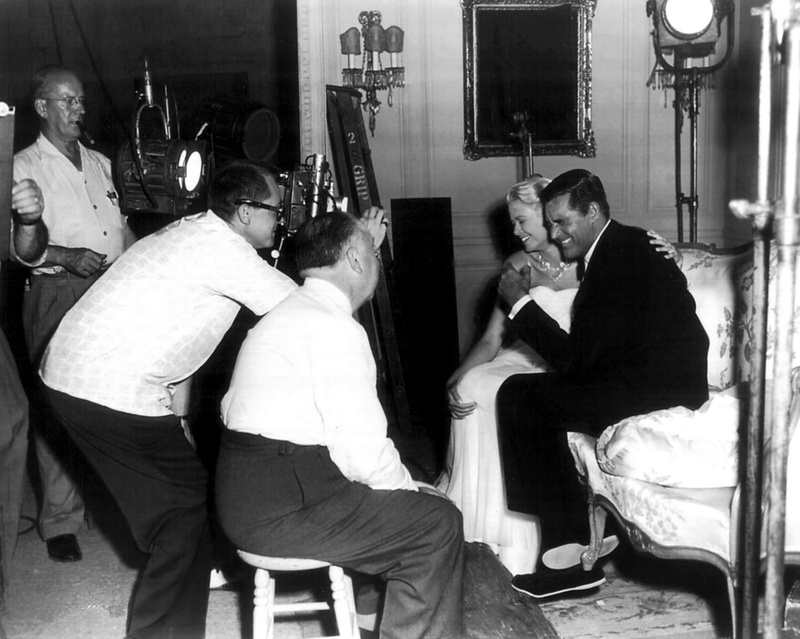 He gave her a 10.5-carat emerald-cut diamond engagement ring, which she wore in her final film, High Society (1956). Here she is between takes admiring the ring. Kelly, her family, and bridesmaids traveled to her wedding in Monaco aboard the ocean liner the SS Constitution. 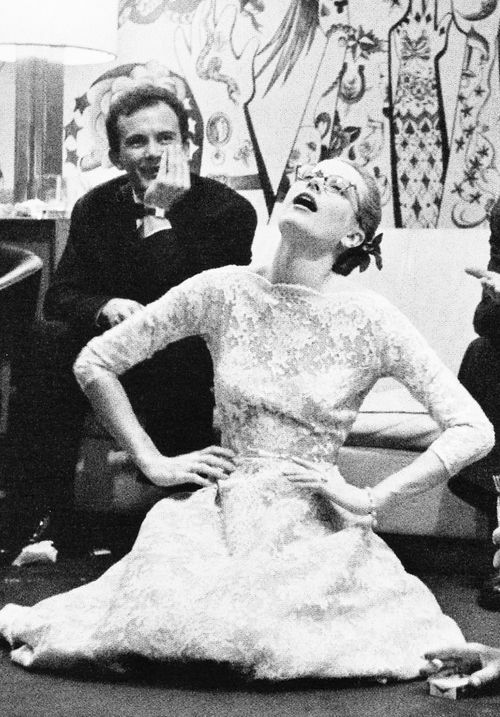 The group enjoyed playing charades in the evening; the photo above shows Kelly during a particularly intense game (Photo source: Bellecs Tumblr). 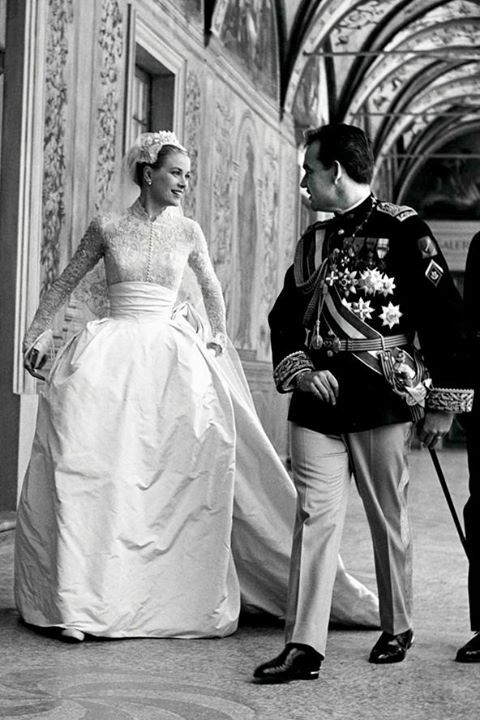 Kelly and Rainier had two wedding ceremonies in accordance with Monegasque law. 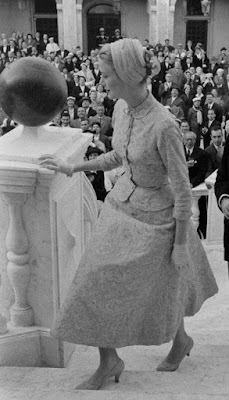 The photo above shows Kelly arriving at the Palace of Monaco on April 18, 1956, for the civil ceremony. The lavish religious ceremony on April 19, 1956, at St. Nicholas Cathedral was a worldwide media event with around 30 million people watching on TV. The glittering guest list included old Hollywood icons Cary Grant, Ava Gardner, David Niven, and Gloria Swanson. 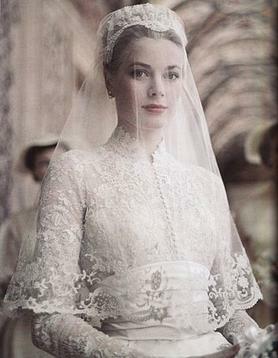 Kelly's elegant wedding dress was designed by MGM costumer Helen Rose. The Alencon lace and peau de soie silk gown was the studio's wedding present to Kelly (Photo source: Wikipedia). Kelly's film career ended after her marriage to Rainier. 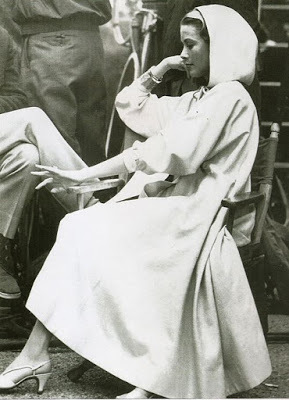 She briefly considered returning to Hollywood to make Marnie (1964) with director Alfred Hitchcock, but those plans never came to fruition. Instead, Kelly served the people of Monaco through philanthropic and diplomatic work. 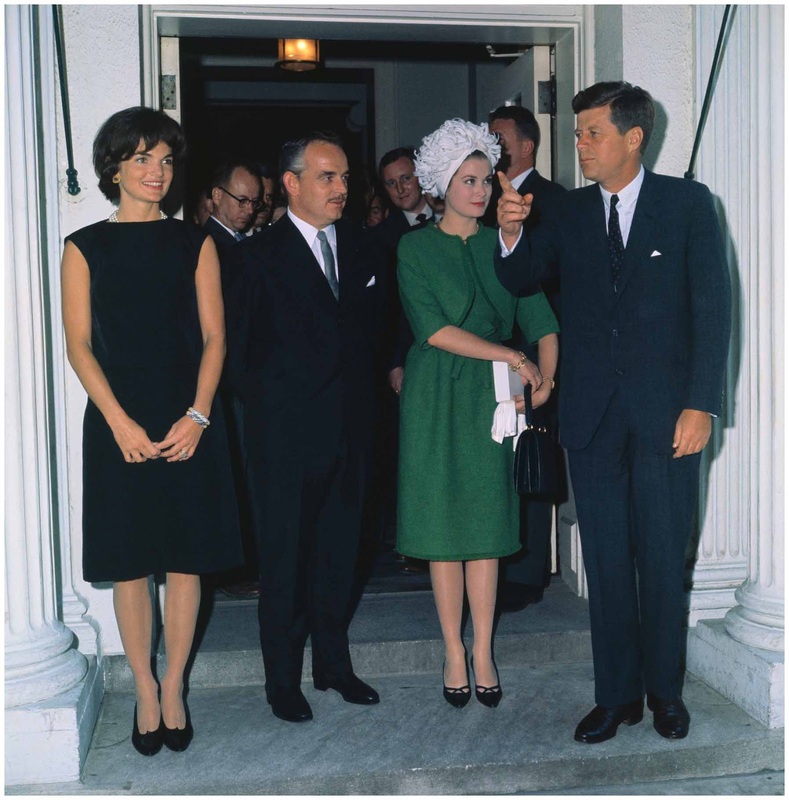 The photo above shows she and Rainier with First Lady Jacqueline Kennedy and President John F. Kennedy during their 1961 visit to the White House (Photo source: Corbis Archive). Kelly also cherished her role as a mother. This photo shows she and Rainier with Prince Albert and Princess Caroline. 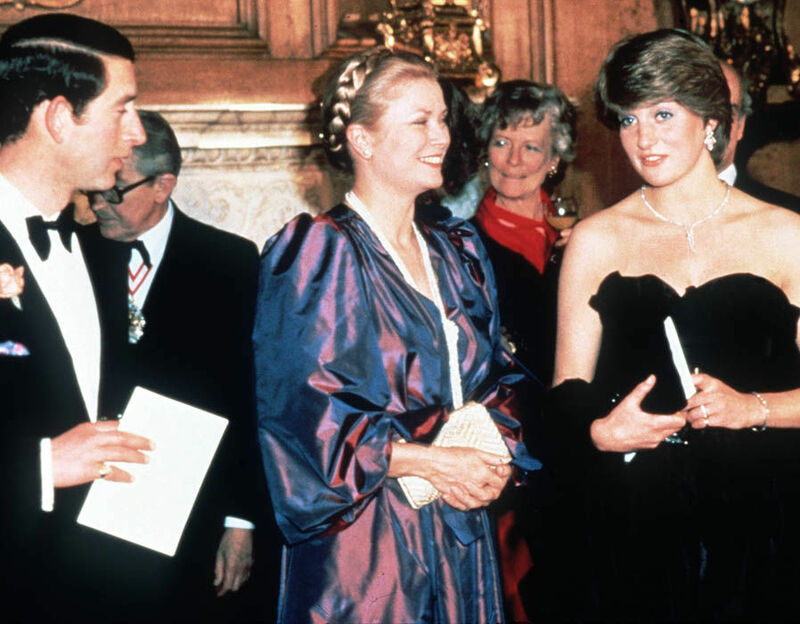 Not shown is Princess Stephanie, who was born in 1965 (Photo source: Vanity Fair). Kelly continued to be a fashion trendsetter after she became a Princess. 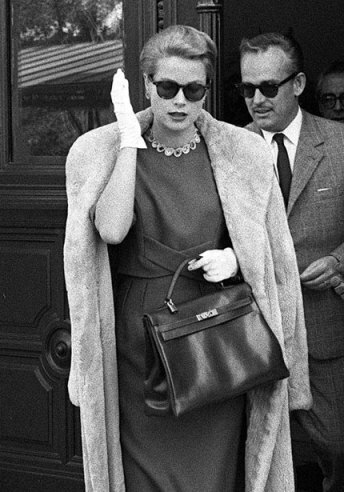 This photo shows her with the iconic Kelly Bag from the luxury goods manufacturer Hermes. Kelly bought several of the elegant yet functional handbags at Hermes' Paris store and used them to hide her first pregnancy from the hordes of paparazzi who followed her every move. The bag quickly became a must-have for fashionistas around the globe, and it is still one of Hermes' best-selling items: You can pick one up if you've got around $5,000 to spare (Photo source: MyLusciousLife.com). Kelly met Princess Diana, who was then engaged to Prince Charles, at a music recital in 1981. Diana later remembered Kelly as "sweet," and the two ladies shared a private chat. Tragically, Kelly passed away less than two years later. She suffered a minor stroke while driving a car in the south of France on Sept. 14, 1982. The stroke caused Kelly to lose control of the vehicle, and she later died from injuries sustained in the accident. Diana represented the British royal family at Kelly's funeral. 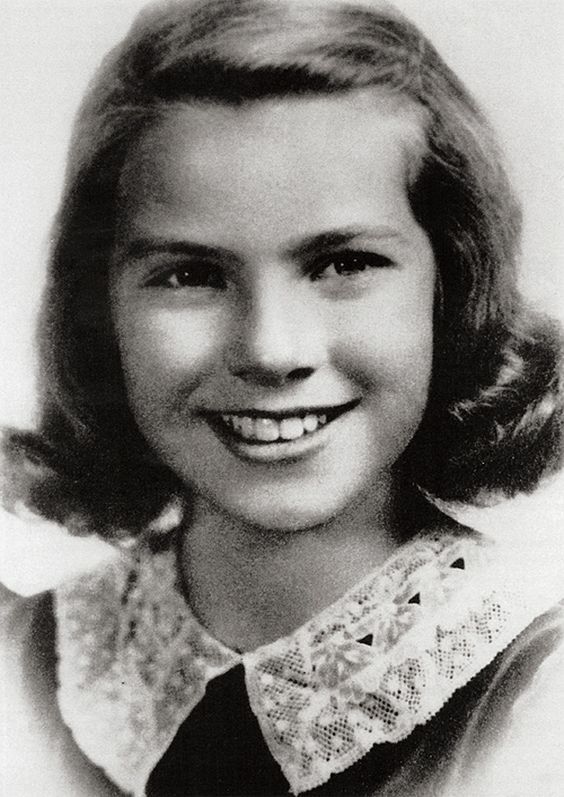 In a bizarre twist of fate, Diana also died at a tragically young age from injuries sustained in a car crash (Photo source: The Telegraph). "You know, I just love Grace Kelly. Not because she was a princess, not because she was an actress, not because she was my friend, but because she was just about the nicest lady I ever met. Grace brought into my life as she brought into yours, a soft, warm light every time I saw her, and every time I saw her was a holiday of its own. No question, I'll miss her, we'll all miss her, God bless you, Princess Grace." 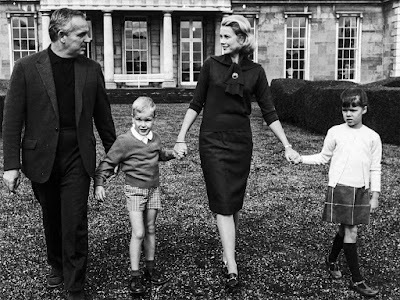 Aww Jimmy :'( <3 He was a great man... That was a fun way to explore the life of Grace Kelly! Informative and entertaining for our eyes with all those wonderful pictures! 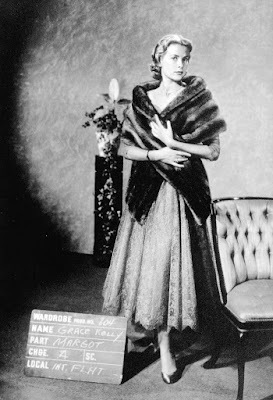 Grace was indeed one of the most photographed ladies on the planet. 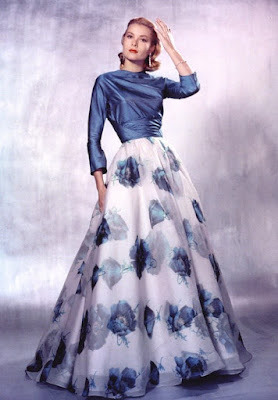 You might have seen my Grace Kelly album on facebook. I have around 800 photos in it and I'm still discovering some I never saw before! Great post. I especially like that bit with her and Diana. Great Story!! I love to read biography of famous Hollywood stars. Grace was very talented women and I especially ready to read women story. Few days ago, I read Dina Meyer great actress biography and also saw her movie “Restitution Road” on women story theme. I am too much impressed with great people’s story.